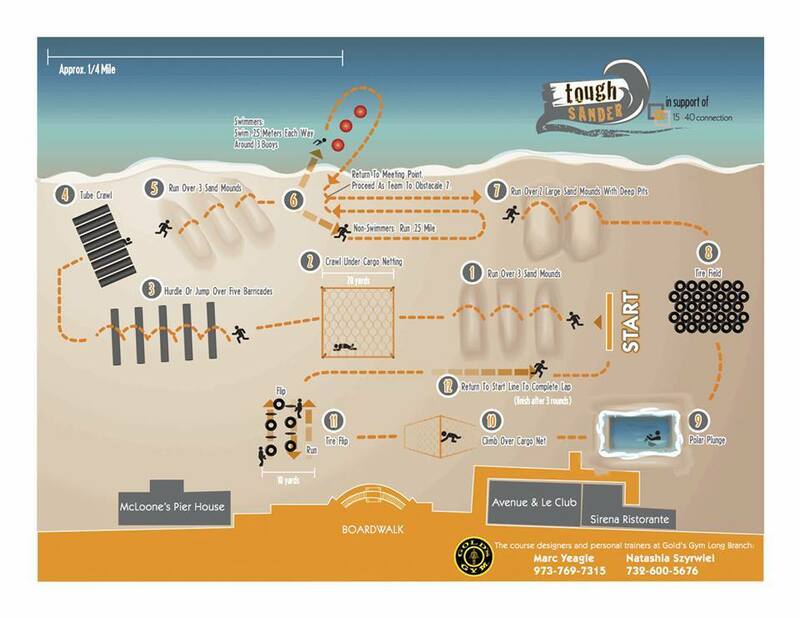 My race report from the 2014 Tough Sander, an awesome obstacle race on the beach at Pier Village in Long Branch, NJ. Definitely one of my favorite events, and better than all other "mud runs" I've done. It benefits local charity 15-40 Connection. It’s the weekend after Labor Day. There are hot summer temperatures at the Jersey Shore. And I just had one of the most fun days at the beach this year! That was because of Tough Sander, the best obstacle race I’ve done so far. I’m not a serious “mudder”, but I’ve done a few such fun races, and Tough Sander is by far my new favorite. 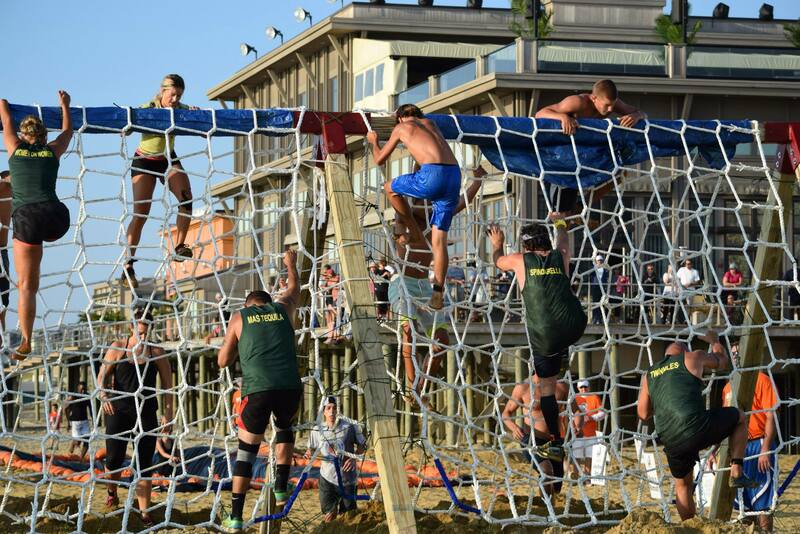 There must be a dozen “mud” and “color” races in the Monmouth and Ocean Counties every year, and while they’re cool, they’re all about the same (and they share the same 2 locations). Tough Sander is completely different. We’re at the Jersey Shore, so why not replace the mud with sand? Bear in mind that this is not the equivalent of the Tough Mudder. It’s not 12 miles of killer challenges. It’s on par with Rugged Maniac, Spartan Race and other short events. The course is just about 2.5 miles, which most people cover in 25-35 min. Tough Sander is at its only 2nd edition, after being created in 2013 by the 15-40 Connection, a small charity that empowers people to recognize potential cancer symptoms so they can benefit from the life-saving advantage of earlier cancer detection. Since 1975, cancer survival rates for people between the ages of 15 to 40 have barely improved and delayed diagnosis is an important culprit of this problem. The race takes place on the beach at Pier Village in Long Branch, NJ, and it has 3 loops roughly in between McLoone’s and Sirena Ristorante. The first thing that striked me was the small number of people. The organizers really have to market the race better and spread the word. Any other obstacle race has over 1,000 people, sells out early, and costs around $100. This one only had about 150 people at the start, and on-site registration was just $50. 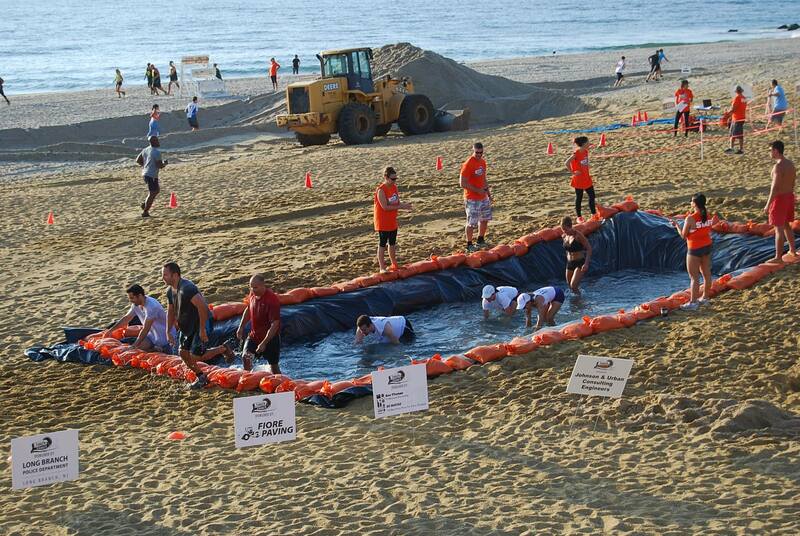 I see no reason why the Jersey Shore runners and mudders wouldn’t go to the incredible event – if only they’d know about it. Back to the race, the most enthusiastic participants were the crazy teams that joined their forces together to have fun… and tackle some challenges. I went as an individual, so I was on my own, but there weren’t really any tough obstacles. It was a very fun course, which made for a short, intense workout. I don’t think I ever went faster than 9:00/mi, but it was a highly anaerobic effort throughout. As you might probably be aware, the “mudders” are just a bunch of weirdos 🙂 and I just went as a runner. So even if I was in the 4th wave, after about 5 minutes I was all alone (there were a few people way ahead). That’s why the first loop was harder because often I’d have no idea which way to go and I actually had to stop and ask the volunteers for directions. So here’s the overview of one loop: It starts with a series of 3 average sand mounds, to get your heart pumping. Then you climb a bigger mound and dive under a low net, crawling through the soft sand. Once out, there are 3 more slightly-higher mounds in between 2 sand-bag barricades. At the turn-around point, you crawl inside some tubes (tip: to avoid scratching your knees, sit and crab walk through them). There are more sand mounds to climb and then it’s decision time! Swim about 50 meters in the ocean, or run a .2mi loop. Of course I didn’t swim in there, and this was the longest running stretch of the race. I chose to go very close to the water where the sand is harder. Then there are 2 huge sand mounds, which require quite some effort to climb, especially on the 3rd loop. As you turn around at the south end of the course, you have to hop through a tire field. And then it’s what they call a “polar plunge”, which is just a shallow pool of refreshing water. I think we were supposed to crawl through it but it wasn’t strictly enforced. You could walk, but on the 3rd loop I really enjoyed plunging into the water, as it was getting very hot and humid. And then it was the most difficult obstacle, the cargo net climb. A lot of racers had trouble here going very slow, which created long backups on the 2nd and especially the 3rd loop. The final challenge was the tire flip team task, which I didn’t have to do as I wasn’t part of a team. After the 3rd loop, you turn around to the finish line. I was all by myself there again, as I was on the 1st loop, and I ended up finishing in 5th place, with a time of 0:28:21. The post-race party was on the boardwalk by the gazebo, with lots of food, entertaining DJ music, vendors and other cool stuff. And one of the coolest things is they had a fun run for kids, which was just one loop, avoiding the harder obstacles like the cargo net and tire flip. Being just in its 2nd year, the organizers did a tremendous job setting up the course and organizing the whole thing (a lot of volunteers helped too). I definitely plan on doing it again, and I’ll try to spread the word as well as I can to make the Tough Sander into the much bigger event it deserves to be.